Canowindra is situated near Cowra. It is a historic town in the central west part of New South Wales in Cabonne Shire, Australia. Canowindra is along the Belubula River. Gaskill Street, the main curving street is partially an urban conservation area. Canowindra and its environs have a population of about 2,381 according to the 2011 census. 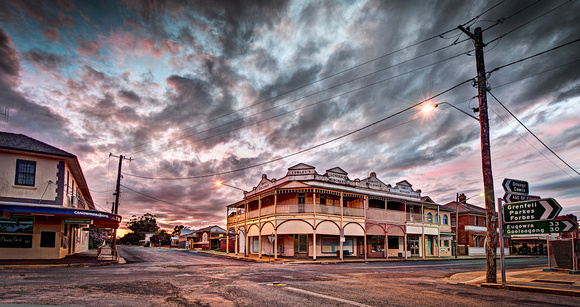 Having a stroll through Canowindra feels like stepping into a period movie that is dotted with modern living wonders. There are beautiful guesthouses, quaint shops, and country pubs nesting alongside art galleries, designer clothe shops, cafes, and homeware shops. This is a destination that is worth driving to. Canowindra is just about 33 km north of Cowra, and it takes about 20 minutes drive. Canowindra is a word that is derived from another word ‘Wiradjuri’ and it means ‘home’, and when in this town, you feel like you are at home. It is breathtaking to walk the Main Street which is heritage listed. The spectacular Ages of Fishes Museum is situated at end of the main street. This museum houses old fossils dated more than 360 years. There is also a Visitors’ Information Centre. You can travel up Ferguson Street from the Museum where there are more shops hosting giftwares and antiques as well as local wine tasting and art. The local vineyards are renown for consistently producing premium award-winning wines that have made them cause a stir in the world of wines. You can see for yourself the fuss about these vineyards at the local cellar doors that offer wine sales and tasting. In addition to that, this area is known for having excellent food. A 100 Mile Lunch is hosted every April where long tables are arranged along the main street to offer a communal feast featuring exceptional regional produce as well as wines that have been sourced from around the area— a 100 miles radius. This festival is built on the concept of acting locally but thinking globally. Visitors who like enjoying a flight of fancy, then Canowindra may be the perfect place. It is termed as the Ballooning Capital of Australia. Hot air balloon enthusiasts find this area the ideal place to discover adventure activities. The sceneries are also perfect for ballooning. Canowindra ballooning activities allow you to have a bird’s eye view of this area. It is a nice way to set off for the day adventure activities. This town is among the most recognized, having recorded some of the greatest fossil discoveries in the word from the Devonian period. A road worker discovered, by chance, a fish fossils believed to be 360 million years old. These fossils date back from the Devonian period during the Paleozoic era. The fish is believed to have been buried after it was trapped when a pool of water dried up. In case you plan to visit Canowindra, there are abundant of things you can do and plenty of places to visit. You will get the best experience on your trip that will always remain a memorable adventure.